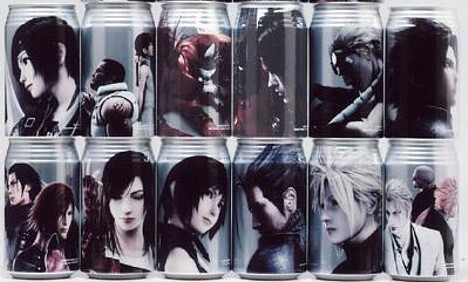 To help commemorate the 10th anniversary of the release of Final Fantasy VII, Suntory has announced plans to begin selling its vitamin-packed Final Fantasy VII Potion carbonated drink in special aluminum cans featuring depictions of Cloud, Sephiroth and other characters from the game. Sixteen different character cans will be available at a price of 191 yen each when the limited-edition 4.8-million can shipment hits shelves on October 23. I just bought 2 today it was abit ecpencive 10 bucks each but its worth it , due to the hella coolpoctures.